I know what you’ve probably all been thinking: TBEX is being held at a glass museum? Really!? Think about your interactions with glass every day. You drink your juice out of it in the morning. You look through it when you peer out a window. You cook with it when you make a casserole. But did you also realize you carry it around with you every day? I’m not talking about the eye glasses on your face that help to magnify the world around you—I mean the glass in your pocket that allows you access to a world of information literally at your fingertips. From the screens of smartphones to the display glass on computer and TV screens, and even the fiber optic technology that enables it all, glass is the transparent material that connects our lives. And…it enables how you do your job! Who knew, right? Are you already thinking about glass a little differently? That’s our goal at The Corning Museum of Glass. We tell the story of a single, transformative material. You may arrive at the Museum thinking you’ll see a Pyrex display or learn about the history of the light bulb, but—if we do our job right—you’ll leave having just seen glass in an entirely new light. This is the Megaplanet by Josh Simpson. 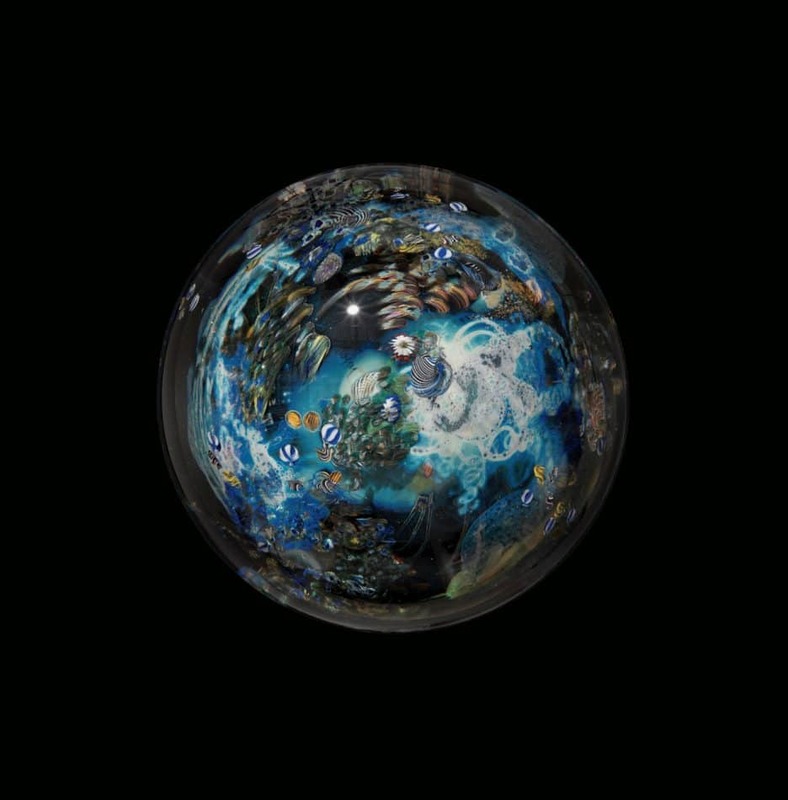 It’s the Museum’s 1000th paperweight and weighs over 100 pounds. The average visit is nearly five hours! And you’ll get to find out why. All TBEXers will have free admission to the entire campus for the duration of your stay. Want to conduct a meeting? Find your favorite bench in the Contemporary Art + Design Wing, or go watch a Hot Glass Demo. Need to get some work done? We have free Wi-Fi across campus, so you’ll be able to work wherever, whenever. Be sure to check out the Rakow Research Library which offers quiet spaces to meet your deadlines. Need a mental break? 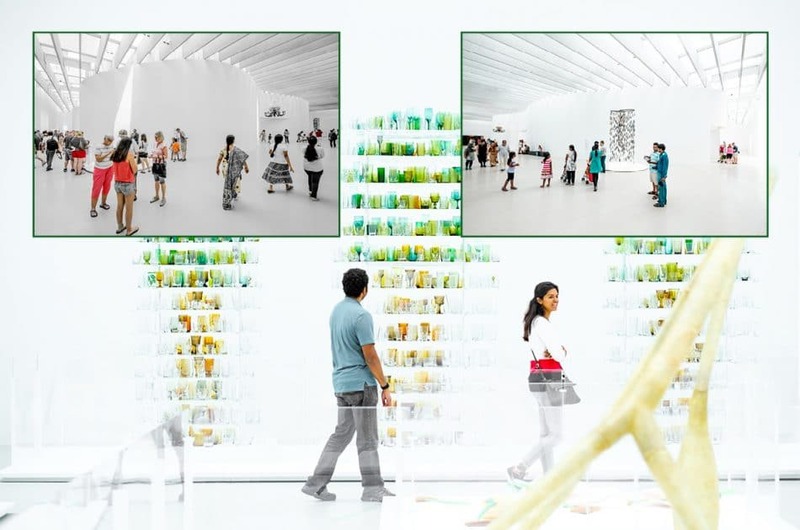 Stroll through the galleries and see some of the best glass art in the world. The Museum has 50,000 objects in its collection, spanning 35 centuries. From floor-to-ceiling contemporary displays to meticulously crafted works from Mesopotamia, you’ll be amazed by the many forms glass can take—and by what skilled craftsmen can do with a material comprised mainly of hot sand. You can make your own glass! Yes, that’s right—at The Studio, you can work with a material hotter than volcanic lava. Choose from blown glass pumpkins, pulled flowers, and flameworked beads. When you pick up your badge, you’ll be able to sign up for a glassmaking session! Space is limited; first-come, first-served. Just for fun, you’ll also get a little piece of glass of your very own. I’ve been hard at work flameworking glass beads for all of the TBEX lanyards—that’s melting glass rods over a 3,000° torch to make beads. I’m hoping my creations will inspire you to try making glass yourself! Take it from me: Hot glass is completely addicting. 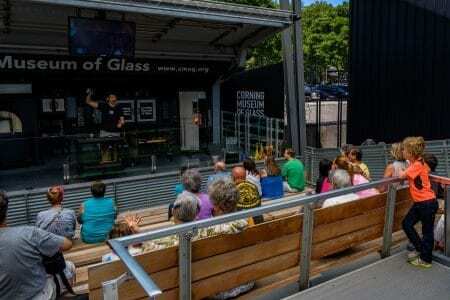 The Amphitheater Hot Shop is the world’s largest space in which to watch a glassblowing demo. Visiting artists from around the world make unbelievable creations in this space. But, it’s going to be completely transformed into the coolest speed networking venue ever! Hot glass travels? You’re going to get to experience our mobile glassmaking studios in a couple of different ways. On Wednesday evening, be sure to stop by Watkins Glen where our GlassBarge will be docked in the harbor. This is a glassmaking studio on a canal barge! We’ve been traveling from Brooklyn to Buffalo and down to Watkins Glen this summer, retracing the journey that glassmaking took when the industry came to Corning 150 years ago. GlassBarge will be doing drop-in demonstrations for TBEXers from 6:30-9 p.m. right in front of the Harbor Hotel in Watkins Glen. 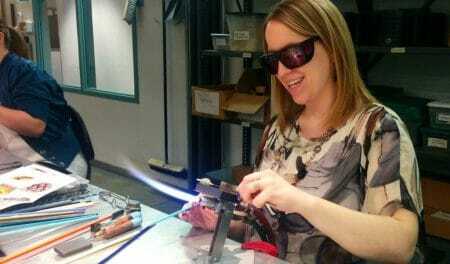 Our Hot Glass Roadshow is going to be one of the breakout session stages! This is a mobile studio on a tractor trailer truck, which we park at the Museum each summer and use as another demonstration space. It’s a pretty unique setting for one of the session spaces, right?! Stick around for TBEX’s hottest closing party ever! We often host parties we call “2300°,” which is the temperature of the reheating furnaces in our glass studios. Trust me, these parties are HOT! We’ll close out the conference with amazing glassmaking demonstrations—all in the completely transformed speed networking space. We’ll feature wine from the Cayuga Lake Wine Trail, and New York State foods. You’ll be able to participate in glassmaking projects if you haven’t had a chance yet during the week. Receive 20% off all purchases in The Shops, which fills the entire ground floor or the Museum. Make your purchases during the week, or wait until the closing party, since The Shops will be staying open late! Kim Thompson has worked in tourism PR in the Finger Lakes for nearly a decade, first at the Steuben County CVB, and now at The Corning Museum of Glass. 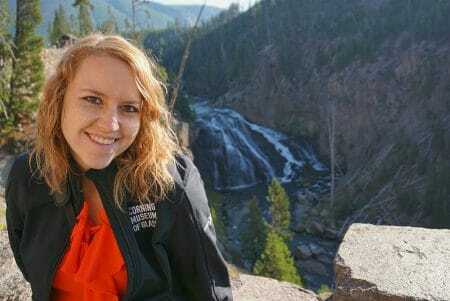 She is an avid traveler, spending time in nearly 30 countries. Her first TBEX in Toronto inspired her to start her own travel blog, Byte-SizeTravel.com. She has been dreaming about TBEX Finger Lakes ever since, and is beyond thrilled to welcome you all here!